Hail and well met to all my plastic peeps. After missing most of last week’s Jams so I could check out a taping of the Colbert Report, I was amped up for our weekly gathering on May 13th. It was my daughter’s 15th Birthday (WTF??!! ), and our first 2010 Guest Jammer Initiative Invitee, Steve The Beast Hayes, had arrived from Seattle on Wednesday. Of course he went straight from the airport to the Bandshell to Jam, so of course he was primed. The day was gorgeous as I wandered onto our Green Beach. I could see The Beast, Young Dan, Young James, and a lovely young lady doing a bit of a Light Toss down on the southern end of the Meadow and knew it was going to be on. As I settled in The Oracle, Ben-Heaver, Fearless Lou, Mary-Mary, Enzo (with daughter Emma), and the Ageless Trevor Brown arrived. I figured it would be best to loosen up the arm with a dose of Ben’s devastating overhand and heading out for long tossing. As always, we locked in quickly and soon were firing strike after strike at distance. Once I broke a sweat it was time to get my jam on though had to be a good host and all. When I got back to the Tribe, who did I find gracing our presence? Why we had Jonathan Willett in from the mountains of Colorado as another smokin’ surprise of a Guest Jammer. Oh Baby, this is gonna be good! The Beast, James, Dan and I got it moving and were soon joined by my boy Fearless. When an A*TGJI invitee is in the Jam, any number is appropriateâ€”as long as you don’t drop. Mr. Hayes showed that his nickname is well deserved. He snaps off every throw with Z’s and accuracy, plays harder and smarter that just about anybody, and has a preternatural knowledge of what the disc is calling for right now. Just as this Jam was heating up, J-Will said he wanted to check out how we were doin’ things over here. Then it was off to the races. Normally I do not designate the opening volley as the Jam of the Day, but this one set the tone for what was to come later. About three throws into the Jona-Hein era, we hit a six (6) man O’Malley which James dispatched with a big air Gitis. 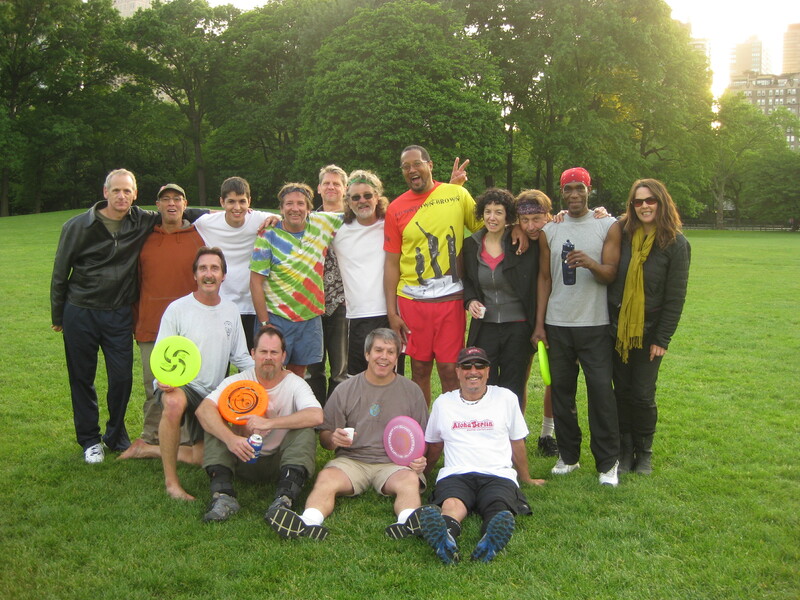 The next go ’round had only 4 passes so he (James) snatched the disc out of the air with a very Bad Attitude. The Kid was on fire now. He doubled down, hitting a Gitis pull off of a Beastly backhand; working a sweet combo; and then sealing it with spinning Gitis. This inspired Daniel to answer with Shredful Series of moves that ended with his own Gitis. That got the rest of us Crustaceans very excited indeed. J-Will played his high-diff (yet, understated) game with aplomb, the Beast showed off his ferocious disc-dexterity, Fearless Lou attacked the Jam with vigor, and I did my best to hustle, playing point guard for this early Everyone in the Pool Jam. While we were goin’ at it, Roger, Doug E. Fresh, TedShred and the Lovely Chrissy, Bradford T., JB, and Mojito Man Jay all joined the party. There were many notable combinations as folks flowed into an out of Jams, replenishing their fluids with some Meadow Ambrosia, and heckling when appropriate. The Beast and The Oracle went at it for a while, enticing the Roginator into the fray. The latter nailed a killer combination into Gitis, which Mr. Hayes answered in kind. Joey took on the burden of Onus with relish, but he had his own ideasâ€”he executed a smooth series of rolls, brushes, tips, and deflections which he sealed with a flying left-handed Figure 4. He’s a Baaaad Man! Other Jams included J-Will/Daniel/James/ and Fearless; TedShred/J- Will/James/Fresh; The Oracle/The Beast/and TP-TJH. Each one of these grouping played off of the high energy and skills brought in by our out of town friends, and the level of play reflected it. People hustled to the sound of Get it, Pete! and were urged on to greatness by the peanut gallery shouting â€œPlay Better! Our international brethren Claudio and Clay are scheduling a stop in NYC in August. When are YOU comin’ down? P.S. On Friday, The Beast Jammed at Washington Square Park with The Oracle, broke for oysters, then Jammed for two more hours at the Meadow. Saturday, he was out all day again, and I believe he did his thing Sunday too. THE BEAST WAS EAST!!!!!!!!!!!!!!!!!! !